Food always seems to taste better when traveling or in unfamiliar surroundings. Perhaps it’s because travel sparks curiousity, often resulting in food experimentation and spirited dining experiences. Perhaps it’s because food tastes better when someone else prepares it for you. Whatever the case, we make it a priority to sample new foods when traveling, even if its only a few hours away from home. On our most recent trip to Victoria, we were invited to dine at LURE Restaurant and Lounge, conveniently located within the newly renovated Delta Ocean Pointe Resort. We don’t normally dine at hotel restaurants. It’s not that we have anything against hotel restaurants, we just prefer to get out and explore a city’s restaurant scene. However, the invitation to dine at LURE Restaurant allowed us to change our normal routine and fully enjoy the comforts of the hotel experience. It was a welcomed change, especially with Baby B along for the ride (it’s so much easier to tend to a baby’s needs when you’re table is only an elevator ride away from your room!). We enjoyed the restaurant’s casual setting and soaked up the unobstructed harbour views with a locally brewed Lighthouse Brewing Race Rocks Amber Ale. It was so nice to have a dining experience with Baby B and not feel like his presence was unwanted. He was certainly a big hit with the servers and neighbouring diners. Although we don’t consider ourselves to be full-blown foodies, we do find ourselves snapping photos of our food when we’re traveling. With that, we hope you enjoy the foodie photo journey below… it was a delicious weekend! Eggs Benedict à La LURE with smoked salmon – great way to start the day! When we were dining the evening before, we noticed another guest snapping photos of her food. 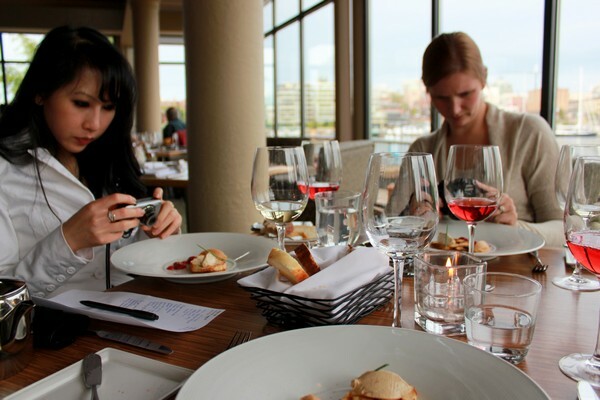 I remember saying, “at least we’re not the only ones taking photos of our food”. It made us feel a little less dorky when we pulled out our camera before digging in! Ironically, later that evening we connected with Mijune on Twitter. She runs a Vancouver-based foodie blog (Follow Me Foodie) and was also invited to experience the hotel and restaurant. We had never met before but thought it would be fun to dine together on our second evening. Fortunately for us, the chef prepared a 7-course tasting menu, allowing us to sample several dishes and wine pairings. It was fun dining with another blogger that focuses on a different niche. You can read Mijune’s foodie reviews here. Creamy carrot soup for Nicole. She’s a vegetarian but enjoys seafood – I guess that makes her a Pescatarian? Chocolate Pot de Creme served with candied bacon, vanilla poached orange and pistachio crumbs. This dessert officially proved to me that bacon can be served with everything! Do you like to dine at hotel restaurants? Care to share your favourite hotel restaurant or most memorable hotel restaurant experience? Share your feedback in the comments section below, we’d love to read about it! Disclosure: we were invited as guests to the Delta Ocean Pointe Resort and LURE Restaurant and Lounge. As always, thoughts and opinions are entirely our own. Those are definitely yummy foods and I just want to check them out someday when I get a time to have a holiday with my husband.. Makes me crave for more! It was certainly a delicious evening! This looks amazing! What was your favorite dish? I love it when a hotel has good dining options. For our honeymoon, we stayed at the Bitter End Yacht Club in Virgin Gorda BVI’s and they had an all inclusive restaurant but you could order anything from Lobster, to Filet Mignon, etc. It was such good food and I loved not having to think of the bill at the end of each night… Plus the dining was right on the beach – So romantic! Also, our recent stay at the Hyatt in Paris had the BEST breakfast spread (my favorite meal of the day!) – Chocolate croissants, smoked salmon, meat & cheese trays, homemade breads and pastries, eggs, fruits, yogurts, etc… I could go on! We had been staying at hostels in South America for three months straight and Paris was our first stop in Europe and we got to stay at the Hyatt off points. Needless to say, their breakfast was such a treat after three months of “hostel breakfasts”. Hey Meg – Thanks for sharing! Our fav dish was the halibut, followed by the duck. We feel silly taking photos too… especially at nice restaurants that are filled with people. Wow, that makes me hungry, have to go there next time I’m in Victoria. Mijune is a friend of mine and that’s so trippy I read about her food blogging from your blog. What a small world. Now don’t you wonder how she eats all the food she reviews and still looks so amazing? By the way, I do believe Canadians (and the English), spell travelling with two “ll”s, unless a U.S.A. spellcheck has led them down the garden path. Both options are acceptable ways to spell traveling, in Canada and the US. We made a conscious decision to spell the American way, seeing that a lot of our visitors are from the US. Hey, it’s all about the Google!